More than two thirds of Americans (70%) are overweight or obese. Being overweight or obese puts individuals at risk of other health problems from heart disease, stroke and cancer, to diabetes, arthritis, and sleep problems. Health care cost estimates for obesity range between $147 billion and $210 billion a year; plus $3.8 lost through obesity-related absenteeism. Dynamic web activities matched to the individual’s readiness to change (e.g., stories from people who have lost weight; games to teach portion control, how to read a food label, and how to make healthier fast-food choices; a flip book of colorful fruits and vegetables choices along with simple recipes; ideas for keeping exercise fun and exciting; and better ways to solve problems instead of eating). We have self-directed and coaching versions of our mobile optimized Healthy Eating program. Request a Weight Management Demo! Study size: 1277 overweight or moderately obese adults (BMI 25-39.9) recruited nationally, primarily from large employers. 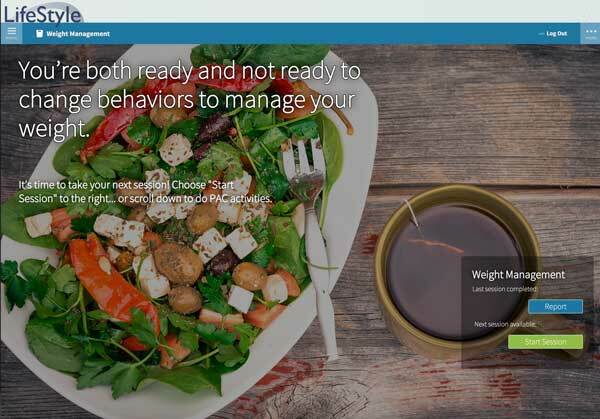 Significantly more (47.5% vs. 34.3%) of those receiving tailored messaging for healthy eating reached the Action or Maintenance stages than the comparison group. Significantly more (44.90% versus 38.10%) of those receiving individually tailored messages for exercise reached the Action or Maintenance stages than the comparison group. Significantly more (48.5% versus 39.0%) of those in the treatment group reached Action or Maintenance for fruit and vegetable consumption. Among those in a pre-Action stage for both healthy eating and exercise at baseline, 29.8% of the treatment group lost 5% or more of their body weight versus 16.6% in the comparison group. This program was developed with support from SBIR grant R44HL070549 from the National Heart Lung and Blood Institute. 1. Johnson, S. S., Paiva, A. L., Cummins, C. O., Johnson, J. L., Dyment, S. J., Wright, J. A., Prochaska, J. O., Prochaska, J. M., & Sherman, K. (2008). Transtheoretical model-based multiple behavior intervention for weight management: Effectiveness on a population basis. Preventive Medicine, 46, 238-246. BACKGROUND. The increasing prevalence of overweight and obesity underscore the need for evidence-based, easily disseminable interventions for weight management that can be delivered on a population basis. The Transtheoretical Model (TTM) offers a promising theoretical framework for multiple behavior weight management interventions. METHODS. Overweight or obese adults (BMI 25-39.9; n=1277) were randomized to no-treatment control or home-based, stage-matched multiple behavior interventions for up to three behaviors related to weight management at 0, 3, 6, and 9 months. All participants were re-assessed at 6, 12, and 24 months. RESULTS. Significant treatment effects were found for healthy eating (47.5% versus 34.3%), exercise (44.90% versus 38.10%), managing emotional distress (49.7% versus 30.30%), and untreated fruit and vegetable intake (48.5% versus 39.0%) progressing to Action/Maintenance at 24 months. The groups differed on weight lost at 24 months. Co-variation of behavior change occurred and was much more pronounced in the treatment group, where individuals progressing to Action/Maintenance for a single behavior were 2.5-5 times more likely to make progress on another behavior. The impact of the multiple behavior intervention was more than three times that of single behavior interventions. CONCLUSIONS. This study demonstrates the ability of TTM-based tailored feedback to improve healthy eating, exercise, managing emotional distress, and weight on a population basis. The treatment produced a high level of population impact that future multiple behavior interventions can seek to surpass.